Fulham have made a move to sign Besiktas forward Ryan Babel yesterday, with the Dutch international returning to the Premier League for the first time since his disappointing spell with Liverpool. Babel joins Premier League strugglers Fulham for an undisclosed fee, believed to be in the region of £8 million. Babel told the club's reporters after sealing a move: "I definitely have faith that Fulham can stay up. That’s one of the reasons that I’m here, to try and help that to happen." Babel becomes Fulham boss Claudio Ranieri's first signing at the club since his own return to the Premier League and will add much needed attacking impetus for the second half of the season. Fulham have averaged just a meagre less than one goal per game and the club's owner Shahid Khan has opened his cheque book to ensure the club will have the players needed to guarantee the best chance of survival. 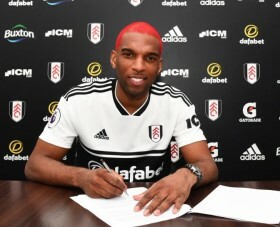 Ryan Babel has signed a two and a half year contract with the Cottagers, with the option of a further season added to the package.